The name of the replication source is shown here. Displays "Text" for text sources, the server name for LDAP sources and the connection for JDBC sources. 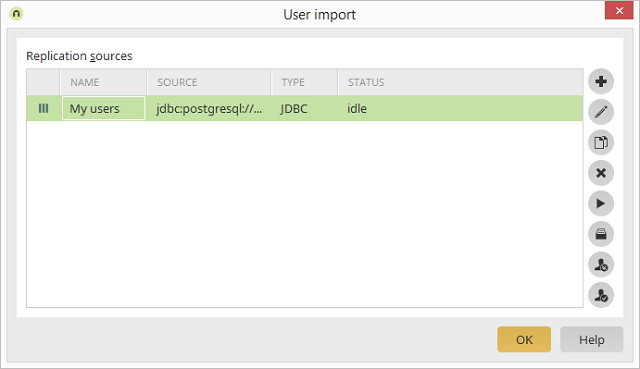 Displays whether a Text, LDAP or JDBC source is in use. Here, you can see whether the replication was successful or whether errors occurred. Opens a dialog where a new replication source can be created. Opens a dialog where the replication source currently selected can be edited. Deletes the source currently selected. Opens a dialog where the settings of the currently selected replication source are already entered. These can then be edited as an additional source. Opens a dialog which provides information about the execution of the replication. The login will not be checked. You can see that this setting is active based on the small square on the source symbol in the first column of the replication sources list. Deactivates the setting described above. When the user logs in, a check is performed as to whether they exist in the LDAP source. If they do not exist, the Intrexx user is deleted and the login is denied.